Thursday, February 13, 2014 by: Dr. Megan Heimer, NHE, J.D, N.D.
(NaturalNews) What if you discovered that a food you were consuming had the same effects on your body as a highly illegal drug and could lead to addiction, cravings, bingeing, chronic degeneration, and even death? In depth studies show that consuming sugar has the same effects on the body as taking heroin and cocaine. Heroin is a white crystalline substance derived from morphine. 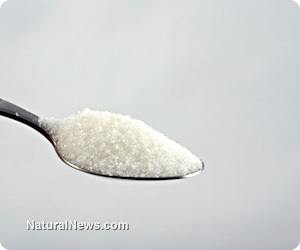 Sugar, is a white crystalline substance most often refined from genetically modified sugar cane. Both are highly addictive, brain altering, and quickly alter and bind to u-opioid and beta endorphin receptors which produce the infamous "euphoric" effect. An overdose or continued consumption of heroine could be fatal. Likewise, continuous consumption of sugar contributes to the leading causes of American deaths including heart disease, cancer, type-2 diabetes, and inflammatory disorders. Sugar addiction is a real phenomenon affecting an increasing number of Americans. In an interview with CBS News 60 Minutes Dr. Robert Lewis (a California-based endocrinologist) stated what numerous studies confirm "sugar is as addictive as cocaine." What causes the high for a heroin addict is the molecules in heroin that find their fit in the beta-endorphin receptors. Sugar produces a similar high by causing the body to produce more beta endorphins. This neurotransmitter gets rid of feelings of hopelessness, depression, isolation, and low self-esteem until the effect wears off and the "low" returns causing another craving for sugar. Several studies along with the Neuroscience Behavioral Review confirm that consumption of sugar also leads to neuro-chemical changes of dopamine in the brain that mimic those produced by drugs like heroin and cocaine. These dopamine surges cause behavioral changes, bingeing, sugar dependence, decreased activity of the receptors that lead to satiety, withdrawal symptoms, and over time cause low dopamine. And so continues the cycle of craving sugar, consuming sugar, and using sugar to fill the "feel-good" void. Inturrisi, C; Schultz, M; Shin, S; Umans, JG; Angel, L; Simon, EJ (1983). "Evidence from opiate binding studies that heroin acts through its metabolites". Life Sciences 33: 773-6. doi:10.1016/0024-3205(83)90616-1.PMID 6319928. Avena NM, Rada P, Hoebel BG. Evidence of sugar addiction: Behavioral and neurochemical effects of intermittent, excessive sugar intake. Neurosci Biobehav Rev. 2008;32:20-39. Megan has a Bachelor''''s Degree in Political Science, a Juris Doctor, and is a Naturopath, Natural Health Educator, writer, parental rights advocate, and stay at home Mama. She blogs at www.LivingWhole.org, a site dedicated to teaching, encouraging, and empowering others to live, love, eat, serve, and raise their babes in unhindered, natural, and wholesome ways. Follow Megan on Facebook.